"The Big Hello" -- written by Ann Zewen. 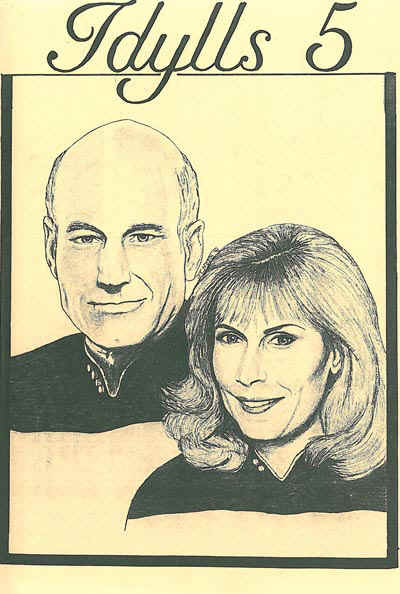 Another Picard/Crusher story, a tale of fantasy vs. reality, of imposters and discoveries. "Future Preferred" -- by Miriam S. Darnell. Did anyone else notice that Riker's "wife" in "Future Imperfect" seemed to be a composite of two women in the commander's life--and one of them was not a holodeck creation? That's the premise that led to this excellent story. "Wishing for a Thing" -- by E. Brooks. A change-of-pace story; to tell you anymore would spoil the story. "The Topaz Heart" -- by Barbara Robertson. This story details one version, a very plausible one, of how Beverly and Jack Crusher met. But who's Lancelot? "9.37%" -- by Kimberley Junius. What might have happened if Geordi LaForge ever met the real Doctor Leah Brahms. The title refers to the holodeck computer's margin of error in creating the Leah simulation in "The Booby Trap." It might not sound like much difference, but ... Watch for the sequel to this one, tentatively titled "All the Shiny Little Ponies" in TANTALUS 3. Poetry by Carol L. Lance. Artwork by Barbara Caldwell, Kimberly Junius, Jeanne-Marie Martin, M.J. Millard and Julie Nosal. Artwork by Ann Crouch, Patricia Demetri, Nancy Gervais, Chris Hamann and Pat Kilner. 100 pages, 8½" x 11" size, comb binding.